But hey, why stop there? There are other fun and easy ways to be Chinese. 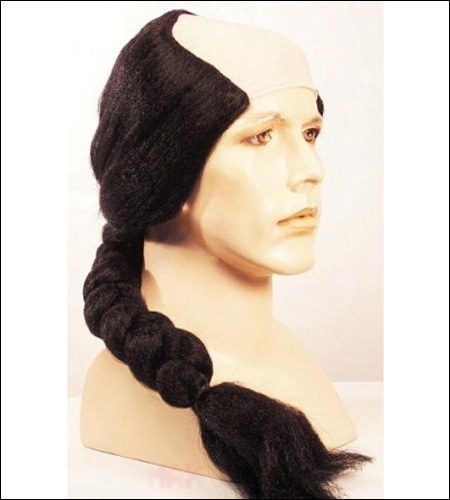 Just try on the Chinese Man wig, “an ancient style with bald front and long pigtail in the back.” But even at the low sale price of $41.48, the Chinese Man wig might just be a little outside your budget. 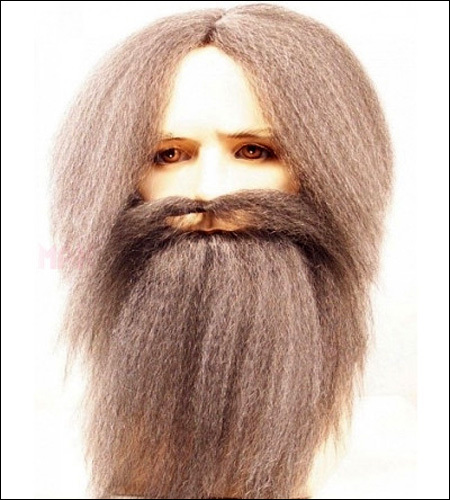 That’s okay, because the Bargain Chinese Man wig is also available for just $22.05. Because nobody should miss out on the racist mockery. 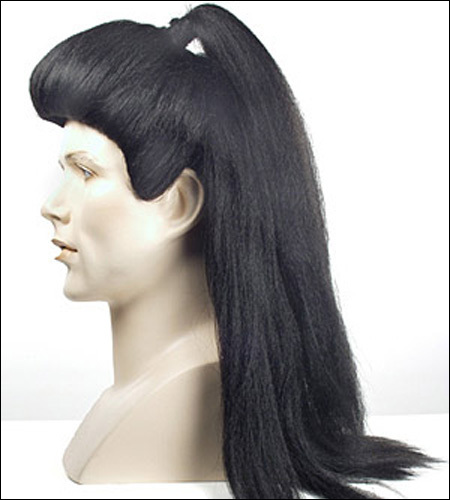 Speaking of bargains, how about this kickass Oriental Guy wig? The attention to detail is just tremendous. I swear, every Oriental Guy I know wears his hair just like this! That’s amazing. Wearing this crappy piece of mess on your head, you will be the coolest Oriental Guy at the office Halloween party. Finally, my favorite one. The Old Chinese Man wig! I have no idea what exactly makes this monstrosity “Chinese.” But it apparently comes in white, gray, brown and black. And according to the website, this wig also works for “eccentric recluse” and “prospector.” Yes, I’m scratching my head too. But the fun doesn’t end there. There are just so many ways to get your Oriental Mystique on! It’s going to be another great Halloween. That’s racist! Angry Asian Man blogs at Angry Asian Man. And he’s not as angry as you might think. Sigh. 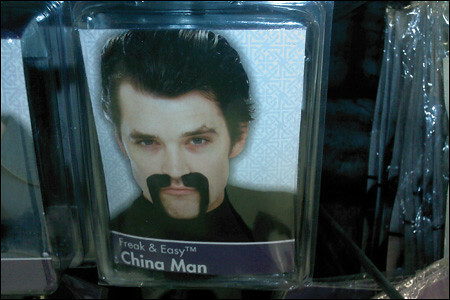 I also saw a Halloween kit the other day-- it says "LOOK LIKE AN ARAB MAN!" with black beard and moustache inside. I don't see how having a black beard and moustache is "Arab." I've seen plenty of non-Arab dudes with black beards. So... they really combined a Qing Dynasty queue with a samurai's chonmage? I don't know if these are really being promoted for Halloween, other than the first one. I went to the website listed above, and these are in a specific section for Asian hair and not in the section labeled Halloween. This website looks to me as if it is a website where theater professionals can order wigs for shows. I'd imagine that these were created to be used by actors/actresses in shows like The King and I, The Mikado, Madame Butterfly, Turandot, Flower Drum Song etc. But I don't think the wig makers intent was to promote Asians as a costume for Halloween. Is it ironic that all of these things are most probably made in China out of actual Chinese people's hair? The bald front/ponytail back wig would be a good start for a pretty bitchin' Klingon costume. Ah, I think the last piece is meant to be a reference to the marial arts film "wise old master" stereotype... As plentifully copied in our pop culture. What? No post about white people and mullet wigs? Halloween is about being something you're not for me. If you don't take it to extremes then what's the point? You have to take it to extremes because people are so similar they have to emphasize the differences to make a costume to represent something else. Is there anybody who does not want to have an ipad touch? Apple has once again produced a fruit of genius---the ipad touch. The fresh product of Apple, iPad touch, is one of the most coveted multi-purpose devices that permit users to browse the Web, use email, play music and games, store photographs and watch videos, TV and films. It also features a laptop or a netbook but it is smaller than that. In addition, the device is 0.5 inches deep and weighs just 1.5 pounds - lighter than any netbook and has a 9.7-inch LED-backlit display with IPS technology. It also contains a 1GHz Apple-built A4 processor which includes the CPU and graphics. It's got a 178-degree viewing angle and sports a 1024768 pixel resolution display at 132 pixels per in.. Sophisticated, isn't it? Who doesn't want to get a feel of its uniquely-designed and sleek body? Features that would make you wish for a free ipad touch just so you could get your hands on the coolest widget of today. The giant multi-touch screen on iPad lets you see net pages as they were intended to be seen - one whole page at a time. One of the other good features of iPad is easily importing and synchronizing pictures from your PC. any sort of video can simply be observed on the massive and high-resolution screen on the iPad. IPad has a big screen with no buttons and no other distracting features. So you can watch your HD flicks, television shows or any videos by feeling completely dunked. To browse and buy podcasts, TV shows or music, just tap on the iTunes Store icon. You may quickly find thousands of TV shows, movies, songs and podcasts. IPad also allows you to preview songs before you purchase them. iPad is virtually integrated with 140.000 apps from the App Store. By drumming the App Store icon on the screen, apps can be scanned, purchased, and downloaded wirelessly directly to the iPad. ?t is even feasible to see topography with the new terrain view. But there is more : you may also search for a close-by business type and tap the business to see the route and directions from where you are. iPad uses a sweeping display and huge, onscreen keyboard to make jotting down notes straightforward for you. iPad provides the calendar you need by displaying Day, Week, Month or List views. Its focus Search feature even permits you to search apps you have downloaded from the App Store. This allows you to quickly find what you're trying to find. Now, with lots of incredibly cool features, who wouldn't want one indeed? True, the ipad could have other disappointments too, like the price . I mean, just imagine how such a light gadget could carry lots of hi-tech features in its body ; you certainly won't expect it to be as cheap as you want it to be. Or certainly you could not expect Apple to create such a device only to give away free ipad touch to us, right? However, there are sites that offer to offer you free ipad touch if you complete their offers and if you're actually prepared to own one, you can check for free ipad touch offers in the net ; Or if you can afford to purchase one, why not? Either way, the ipad touch won't give you any regrets for purchasing it. I believe those dazzling features, fascinating and classy design is reason enough as to why you can purchase one right now! be a great fit for both websites!